Both the Congress and the TRS have a slight advantage, having won from the Bhupalpally constituency once before, while the BJP is yet to do so. A flood of orange flags and banners with the familiar lotus emblem of the BJP greets us as we enter the small village of Jaggaiahpet in Bhupalpally constituency. Bhupalapally is one of the youngest constituencies of Warangal district, having been created only in 2008. The Telangana Rashtra Samithi (TRS) and Congress have both won once from the constituency, with Congress having been elected to power in 2009 and the TRS clinching the seat in 2014. 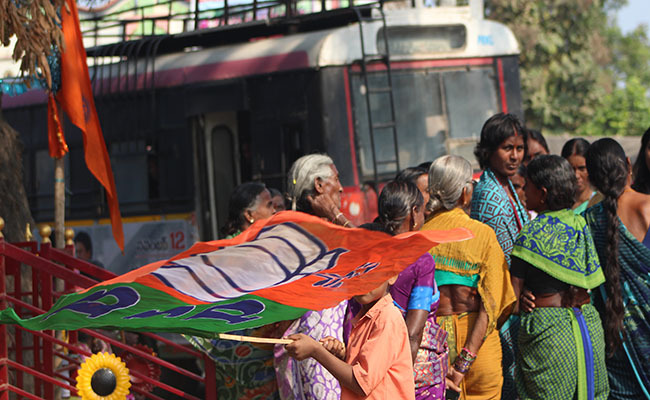 However, this does not deter the BJP’s candidate for the constituency, Chandupatla Keerthi Reddy. 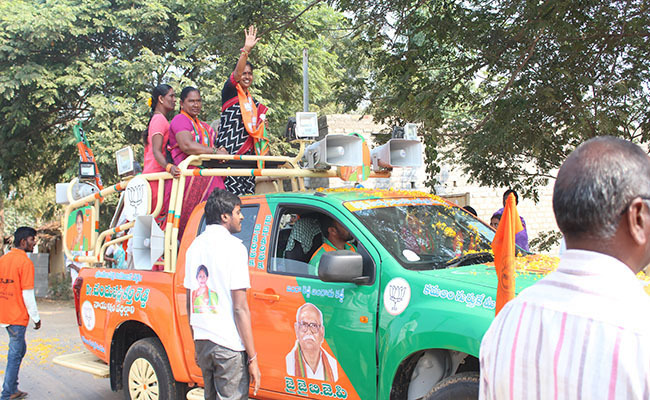 Keerthi stands atop an open-air truck decked with images of BJP leaders and flags of the party as she goes through the locality campaigning. She stands tall, sporting a black sari, with a BJP shawl draped around her neck and showing off the lotus symbol to the crowd and waving. “Bharat mata ki jai!” cheers a man from the sidelines of her campaign vehicle, as the crowd then echoes the same back to him. While Keerthi will be facing tough competition in the form of heavyweight contenders from the TRS and Congress, she remains confident. “The Congress came into power in 2009 by telling people that they’d help the farmers and give them rice and electricity. None of those things have been fulfilled. The people’s support is not with them,” she tells us as we catch up with her. “The TRS came into power in 2014 after them (Congress) and they also promised all sorts of things which they could not guarantee. Prime Minister Narendra Modi came to power in 2014 and has brought about significant changes since then. The people recognize this and will definitely support BJP,” she exclaims. Speaking to several locals, it appears that there is a general consensus among the women that they are in favour of Keerthi Reddy coming to power. “She’s a woman, I feel like she will hear us and understand our needs,” states an elderly woman in the crowd which swarms us right after the rally passes by. “Only a few people got houses. Those who benefitted were the ones who already had money,” adds the elderly Santhakumari, a resident of Sultanpur, which falls under the Bhupalpally jurisdiction. “As a woman, only she will be able to understand the issues we face and will be able to bring about change,” she adds. The women here collectively and strongly adhere to the belief that Keerthi will hear their pleas and will improve their livelihoods, for the mere fact that as a female candidate, she would be able to understand their complaints better and take action accordingly. 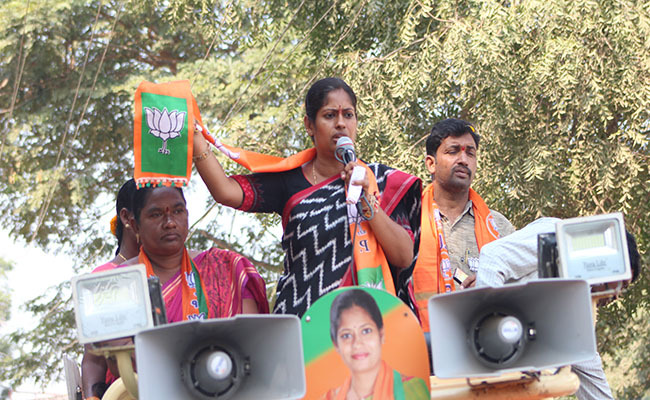 Aware of the fact that she faces a tough race, Keerthi has been aggressively campaigning in Bhupalpally. “I have plenty of visions for the constituency. I want to turn Bhupalpally into a tourism hub. There is a lot of potential here,” she says. In addition to the female voters, she is also targeting a younger crowd. “Unemployment is rampant and I will work to create job opportunities. For 60 years, the Congress has been promising this, but to no avail. Better schools should also be available for the children,” she states. The Congress and TRS have each won once from the constituency in 2009 and 2014 respectively. “Both of them promised many things to come to power. The TRS promised to construct double bedroom houses for people and stated that they would give people of the SC and ST community, three acres of land. They even said that they’d create employment opportunities for people. None of that was fulfilled,” Keerthi tells us. “Things that Congress was not able to do in 60 years, Modi can and will do,” she says. The Congress candidate contesting from Bhupalpally is Gandra Venkat Ramana Reddy, while the TRS has given the responsibility to S Madhusudhana Chary. Chary is incidentally the one who had failed to deliver on promises of building double bedrooms and allocating three acres of land to SC/ST individuals, during his earlier term in 2014. Proving to be an equally competitive candidate is none other than Gandra Satyanarayana Rao, who is running as an independent. Rao had earlier held the post of the district president of the TDP, which he left in November 2017, to join the TRS. Prior to that, he had contested for the BJP in the General Assembly elections in 2014. A few of the people we spoke to voiced their support for him, citing that he deserved a chance too.